Dr Ambedkar was one of the first (and one of the few) Indian leaders to be educated in the United States. I am not sure what influence his years at Columbia University in New York City had on his life, but I know we can be proud to claim some part of this remarkable man’s early development. Two of the qualities which mark his life and career — optimism and pragmatism — may have been enhanced by his contact with this country, which prides itself on its charactersitics of hope and practicality. Although it was Edwin Seligman, Professor of Economics, with whom Ambedkar kept in touch after he left Columbia and to whom he sent students when he taught at Sydenham college in Bombay, John Dewey seems to have had the greatest influence on him. Dewey’s pragmatic philosophy, his theories associated with optimistic, pragmatic American democracy, which preached (although it did not always practice) equality, no barriers to upward mobility, the use of machinery to produce leisure, and an attitude of respect for every individual. Ambedkar’s first political party, the Independent Labour Party founded in 1936, took its name from British politics. But two things lessened the importance of Britain for Ambedkar: the colonial presence of the British in India, and the preference of British liberals for Gandhi and his non-violent direct action campaigns for independence over Ambedkar and the slow parliamentary path. And it also seems likely that American optimism, and the lack of an obvious class system in America, met a natural response in Ambedkar. Ambedkar’s American contacts did not end when he left Columbia University in June, 1916, although one must admit they became minimal. He continued to correspond with Edwin Seligman, his mentor in Economics at Columbia, and occasionally recommended Indian students to Seligman. In 1930, Ambedkar wrote an article for the Columbia alumni magazine which reveals quite a sentimental attachment: “The best friends I have had in my life were some of my classmates at Columbia and my great professors, John Dewey, James Shotwell, Edwin Seligman and James Harvey Robinson.” In 1952, Ambedkar went back to Columbia to receive an honorary degree of Doctor of Laws and it is clear that this recognition of his work meant much to him. It was in this period of the early 1950’s that Ambedkar was publicly critical of India’s foreign policy of non-alignment, which seemed to him to cut India off from American contacts. I shall end this introduction with two stories, since this is not so much a scholarly tract as an essay which attempts to explore an American-Indian cultural interaction in a personal way. Mrs Savita Ambedkar tells a touching story of Ambedkar happily imitating John Dewey’s distinctive classroom mannerisms — 30 years after Ambedkar sat in Dewey’s classes. It is impossible to find in Ambedkar’s life story any hint of a guru or a personality which dominated him, but here at least is a suggestion that he was fond of both Dewey the philosopher and Dewey the man. The other story concerns a letter of recommendation written about Ambedkar by Edward Cannon, Professor of Political Economy in the University of London, to the head of Sydenham College, where Ambedkar applied for a teaching position in 1918. Professor Cannon wrote: “I don’t know anything about Ambedkar except that he came to do a thesis and attacked it and me in a way which showed he had quite extraordinary practical ability…. I rather wonder if he is a pure Indian; his character is rather Scotch-American.” There is absolutely no doubt that Ambedkar was pure Indian, and no one who knew his background and the history of his caste would assign any other nationality to him. But this depiction of his character as “Scotch-American” rather delights me. Why is a temple being built to the Goddess English in Uttar Pradesh? Rediff.com‘s Archana Masih speaks to the man behind this novel venture. There couldn’t be a greater champion of the English language than Chandrabhan Prasad. Prasad, a Dalit thinker, celebrates Thomas Macaulay’s birthday every year and was in the process of building a temple to Goddess English in a village in Uttar Pradesh until the construction was stopped by the district administration saying they did not have permission to do so. Prasad was aiming to inaugurate the temple on October 25, Macaulay’s birthday, and still hopes that the construction will resume soon. He says people may think his belief in English is bizarre and snigger at him, but the same people move heaven and earth to ensure their children go to the best English schools. “Why should it remain the language of the privileged?” asks Prasad who remembers being discriminated by the upper castes when he was growing up in his village. Dalits were made to sit separately at weddings and there was no Dalit child his age who did not eat roasted rats — the only Dalit meat. In an interview to Rediff.com‘s Archana Masih he explained why English was important for young Dalits to get decent jobs and stressed that new methods were needed in social movements for emancipation because old tricks won’t do. 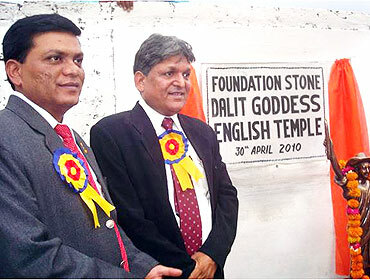 You say building a temple to Goddess English will help Dalits learn English. It certainly is not as simple as that. If you advise people to teach English to their children, there is a chance it may not be taken. So I thought Dalit women could worship English as a goddess. I tell them that you don’t have a goddess, you have Lord Buddha but no goddess, so English is your goddess because English was the language of your emancipator Dr B R Ambedkar. My assessment is that if women start worshipping English as mother goddess there’s no way their kids will escape A B C D. So this can spread as a powerful phenomenon and have more effect than a campaign or writings. It’s not that every child will learn English but once it comes into fashion it will transform lives because in 10,15 years it will be impossible to find a decent job if you don’t know English. A Dalit-dominated hamlet in remote area of Uttar Pradesh (UP) is on the radar of top officials of the Mayawati administration nowadays. At the crux of their interest is a new goddess ‘Angrezi Devi’. Construction of a temple consecrated to this goddess of English is in full swing in Jang Bahadur Ganj village of Lakhimpur Kheri district. But tension has already begun to simmer over this unique campaign to popularise English and modern education among Dalits. Upper castes feel this is the first step towards conversion of Dalits to Christianity. They also feel worshipping ‘Angrezi Devi’ is an insult to Hindu goddesses. “Those who are opposing the ‘Angrezi Devi’ temple are either ignorant or are acting at the behest of some vested interests,” says renowned writer on Dalit issues, Dr Chandrabhan Prasad, who is the driving force behind the ingenious initiative. 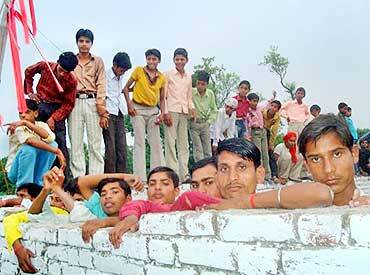 “English education is the primary need of Dalits. We are working on Dr Bhimrao Ambedkar’s inspiration,” he said. A three-feet high statue of the goddess of English is ready for installation. The statue is designed on the lines of New York’s Statue of Liberty. It holds aloft a pen in one hand and a copy of the Indian Constitution in the other. But even as Dalits of Jang Bahadur Ganj toil day and night for the proposed inauguration of the new temple by month-end, top officials in Lucknow are a worried lot. “We have been getting reports of tension between Dalits and upper castes over this temple… we only hope this issue doesn’t flare up,” a senior police official said. State intelligence agencies, he added, were keeping a close eye on the situation. “The upper castes feel this is only a ruse to convert Dalits to Christianity,” he said, adding that a number of people had apprised senior district officials of their objections. “They also see the temple as an attempt to grab land,” the official said. Because of its Dalit dimension, the “Angrezi Devi” issue is highly sensitive for the Mayawati government. So, no senior official is willing to go on record about the controversy. Meanwhile, students of the Nalanda Shiksha Niketan, a local Dalit school, have even written a prayer to worship the goddess in English. The structure of the temple, being built on about 800 square feet of land, is almost complete. Prasad says the temple walls would be adorned with scientific formulae, famous quotes and gems of knowledge from a variety of subjects. However, what remains to be seen is whether this new temple spreads the light of knowledge or the flames of caste conflict.